If you have a classic dinner and drinks date planned, why not make your valentines day dresses timeless too. As we all know, finding the perfect black dress is like a dream come true. 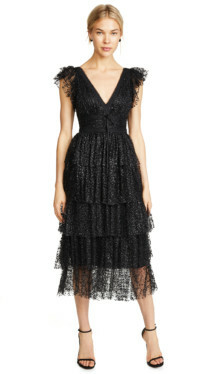 That’s why we’re pinching ourselves over the flutter sleeve cocktail dress by Marchesa Notte. We simply adore the silhouette created by the plunging V-neckline and playful tiered mini skirt. This stunning midi is also made with deep black glittery tulle which sparkles celestially under the light. Additionally, the padded bodice shapes and sculpts your figure which is further defined by the cinched, lace trimmed waist and delicate velvet ribbons. This dress is simply breathtaking. Should you prefer your dresses to be glitter free, opt for the Una off-the-shoulder dress from Preen by Thornton Bregazzi. This stunning gown also includes tulle but here it is used in pleat form to embellish the bodice. 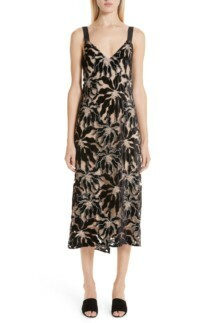 The one-shoulder neckline is creative and playful which ideally complements the voluminous midi skirt. This gorgeous creation is fully lied and flatters the figure with a classic 50’s style silhouette. It’s completely perfect for an evening of indulgence and romance. When it comes to Valentines day dresses that truly have the wow factor, these certainly fit the bill. The Does Charo black dress by Carolina K, for example, is certain to demand the attention of the entire room. This incredible dress slips on and falls beautifully into an off the shoulder silhouette with a ruffle hem. Colourful, reflective sequins then decorate the outer slip which sits on top of the mini black slip underneath. Be bold and style this look with metallic or glittery shoes or keep it simple with heeled sandals. Demanding attention doesn’t always require embellishments or volume. This is particularly evident with the Mathilda cherry dress by Reformation. 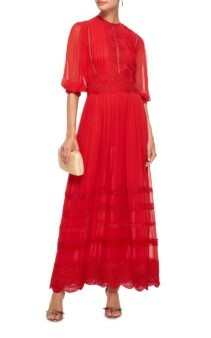 This arresting mini dress is the most incredible shade of red and offers a ruffle-edged neckline, bodice and cuffs. We are head over heels!